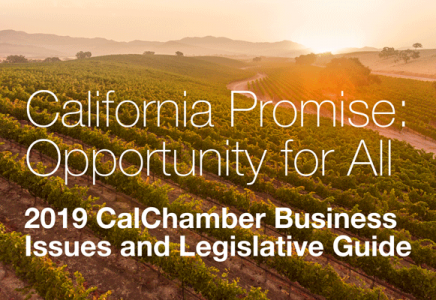 Governor-Elect Gavin Newsom has asked CalChamber President and CEO Allan Zaremberg to join the “All in California” program, a group of two dozen California leaders who will provide the new Governor with diverse ideas and perspectives as he prepares to step into his new role. “I am grateful for the opportunity to assist Governor-Elect Newsom in every way possible during the transition period and look forward to doing all I can on behalf of the business community to help our new Governor succeed,” said Zaremberg. Newsom said his goal in creating the advisory group is to “create an inclusive, people-powered transition that reflects the diversity and values” of California. Monica Lozano, former chair, U.S. Hispanic Media, Inc.
Governor-Elect Newsom will be sworn in on Monday, January 7, 2019.